Whether you’re a long-term practitioner or new to the art, it can be helpful and informative to get a sense of what others get from their practice of tai chi or other Chinese Internal Arts. Some train for relaxation and stress reduction, some to train in martial arts whilst others may be working with a combination of these and other aspects. Whatever it is that keeps you interested and stimulated it may help to inspire others to gain the qualities that have pleased you..
Over the course of these pages you can get an insight to the many ways that these arts are taught, practised and enjoyed throughout Europa and beyond. And there’s no end for going in deeper and the more you go in the more doors open to reveal amazing worlds within. 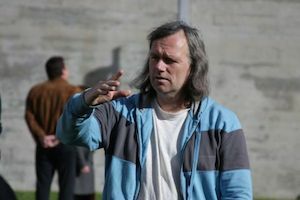 But most of all I think I like that space which is the practice itself, the playfulness of it, the seriousness in it. This space peculiar to any art or creative research, like children playing… And then I love that silent music of Taiji, the hidden rhythms of its forms. And I like it because it’s a never-ending learning and still there is no place to go… and because it’s not about getting anywhere, this is peaceful and very real. It’s here. It’s now. Or nowhere. I like it because it teaches you to understand the language of the body, and because it’s body language it doesn’t mess up that much… I like Taiji because it’s like a good old friend who doesn’t stop surprising me. And then I like it, that I found a bunch of people in it, who I could share this with, play this with, discuss this with, practice this with. At least at times. Tai chi has expanded my world. Before I was a daughter, wife and mother. Now I am Gill that practices and teaches tai chi. I was always interested in fitness – attending and teaching group exercises classes. 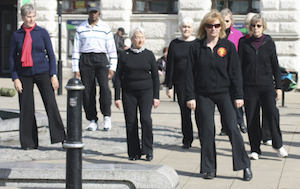 Tai chi changed my focus from the outward impression of fitness to a more internal idea of health and well-being. I used not to go outside my small comfort zone for exercise, only attending the local sports centre and now I am keen to experience more even if it means travelling. I have seen great improvements in mine and my students health, from physical structure to mental and emotional health. I love the fact that tai chi can surprise you. On the surface tai chi is this slow moving form which looks pretty but underneath there are so many layers. Looking to the future, I can see myself travelling further and seeking out more information and underpinning knowledge about tai chi and I am excited about the prospect. Tai chi has wonderful flowing movements, which allow me to feel and to open my body and mind to being grounded and centered. 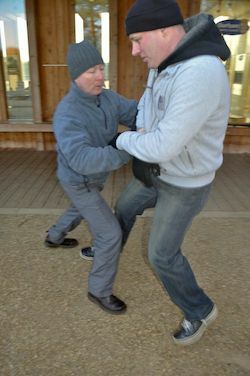 Through Taiji I have found a structured way of training which gives me the space to experience freedom. 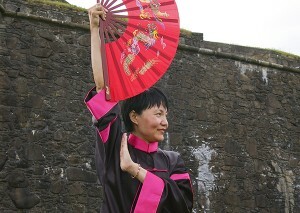 When I do the Taiji-form I flow with energy which is like staying connected to the natural flow of lifeforce whist having a sense of freedom. I like push hands because it provides a unique system for being in contact with people, and to gain so much information about others in a very short time. I can also learn a lot about myself, how I feel, and how I react in different situations. Last, but not least, Taiji philosophie gives me a deeper understanding about life. After 25 years of practice Taiji still holds a deep fascination for me, and I’m sure my life would be poorer without it. I see my Tai Chi journey as being comparable to a walk along an old country lane. This lane runs along the contours of a steep hillside and is old, with dense hedgerows on either side, and narrow. This results in you not being able to see far, most of the time being limited to the immediate vicinity with the occasional view that is immense in scope. For a lot of the time along this lane things seem boring, with only the occasional flower to lighten the trip. Then you will come across a patch that is glorious in colour, or a little face peering out of the undergrowth, to lighten your way. For me, Tai Chi is similar. There is the grind of practice; if you describe what you are doing to a non-Tai Chi practitioner, that is what it sounds like, a boring grind, with no relief. What makes the ‘tedium’ worth all the time taken in practice are the flashes of development and understanding that come; from many sources: teachers, fellow students and the grind of practice. They can come immediately during the rote of practice, during a lesson (relevant or otherwise), or at other times. And, like the view from that lane, they can be small, and local in effect, or vast panoramas of where you still have to travel, and a joy to behold. Barrie Jehu is based on the island of Shetland where he runs the Shetland Tai Chi Association. 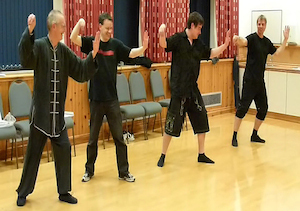 Tai Chi Chuan develops a deep magic sense of being connected – connected with the whole system of our body/mind, and with everything and everyone . . .
Practising Tai Chi Chuan enables us to recognise and become increasingly aware about ourselves, how we are and how we relate to others . 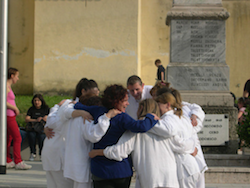 . .
Jessica Agosti is based in Udine, Italy and teaches for the Centro Reserche Tai Chi.